Kidderminster Library, like all other libraries, is a pillar of the community. Based in Worcestershire, Kidderminster Library offers a variety of services and facilities that stretch further than the borrowing of books. It is currently being refurbished by Speller Metcalfe (Malvern) Ltd, who called upon Yewdale Customer Solarfit Blinds to fit 17 vertical blinds. ‘The project at the library required vertical blinds to match the existing blinds we supplied three years ago,’ said Solarfit Blind’s Peter Hodnette. Solarfit Blinds are based in the West Midlands and predominantly supply the education and contract market with quality blinds and installations. When it came to picking out a vertical blind for Kidderminster Library, Peter had no doubts about which to choose. Having confidence in a system is paramount to the success of a project – you need to know the system will be installed easily, quickly and that it won’t let your client down. 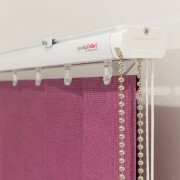 Yet, beyond the installation, the system itself stands up to the rigours of daily use, making it a go-to vertical blind for Peter. ‘The build quality is excellent and I would always recommend it if asked,’ said Peter. The VL30 premium profile vertical blind is a precise and smooth-operating system. Available with 127mm and 89mm louvres, this system can fit even the most demanding environments. And Peter’s thoughts on working with Yewdale?